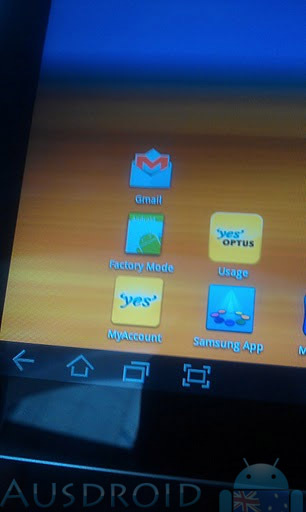 Today we’ve heard from two sources that the Samsung Galaxy Tab 10.1 will be launching on Optus, with the second source even giving us this picture of the Optus Apps on the 10.1. Both of the sources gave us the same approximate release date of September, though Optus are expected to be all stocked up and ready to go mid-August. I bet Vodafone will be rushing to get the 10.1 out on their network before it hits Optus. One of our sources indicated to us that the Galaxy Tab 10.1 could be put in a “power-pack/bundle” with the Galaxy S II (now that IS a power-pack if I ever saw one) on a $99 plan with 6GB of shared data, which is reminiscent of when they bundled the original Galaxy Tab and Galaxy S on an $89 plan. They also said that the 10.1 would be available on Optus Prepaid for around $700-$750. Interesting times ahead for the tablet world, and more interesting to see whether or not Vodafone will play their hand at a Galaxy Tab 10.1 bundle, or even beat Optus on price. where did you get the info of mid august if ur sources said September? Also is it just me or are all these Samsung tables(10.1/8.9) coming out too late? Its 6 months behing the curve(ipad2 was launched in march). and quad core tabs are around the corner. One source said it would arrive Q3. The other was more specific: stock arriving mid-august to go on sale September. Yes but they have to wait for the only company that does their device upgrades to make the announcement first.